Phylogenetically, they may be sister to the Iguanidae, and have a similar appearance. Agamids usually have well-developed, strong legs. Their tails cannot be shed and regenerated like those of geckos, though a certain amount of regeneration is observed in some. 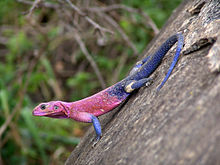 Many agamid species are capable of limited change of their colours to regulate their body temperature. In some species, males are more brightly coloured than females, and colours play a part in signaling and reproductive behaviours. Although agamids generally inhabit warm environments, ranging from hot deserts to tropical rainforests, at least one species, the mountain dragon, is found in cooler regions. This group of lizards includes some more popularly known, such as the domesticated bearded dragon, Chinese water dragon and Uromastyx species. One of the key distinguishing features of the agamids is their teeth, which are borne on the outer rim of their mouths (acrodonts), rather than on the inner side of their jaws (pleurodonts). This feature is shared with the chameleons, but is otherwise unusual among lizards. Agamid lizards are generally diurnal, with good vision, and include a number of arboreal species, in addition to ground- and rock-dwellers. They generally feed on insects and other arthropods (such as spiders), although some larger species may include small reptiles or mammals, nestling birds, flowers or other vegetable matter in their diets. The great majority of agamid species are oviparous. Very few studies of the Agamidae have been conducted. The first comprehensive assessment was by Moody (1980) followed by a more inclusive assessment by Frost and Etheridge (1989). Subsequent studies were based on mitochondrial DNA loci by Macey et al. (2000) and Honda et al. (2000) and also by sampling across the Agamidae by Joger (1991). Few other studies focused on clades within the family, and the Agamidae have not been as well investigated as the Iguanidae. The agamids show a curious distribution. They are found over much of the Old World, including continental Africa, Australia, southern Asia, and sparsely in warmer regions of Europe. They are, however, absent from Madagascar and the New World. The distribution is the opposite of that of the iguanids, which are found in just these areas but absent in areas where agamids are found. A similar faunal divide is found in between the boas and pythons. The chameleons of the sister family Chamaeleonidae are sometimes discussed as subfamily Chamaeleoninae and subfamily Agaminae (referring to Agamidae, not the Agaminae mentioned above). ^ Thompson, M.B. (1993). "Estimate of the population structure of the e[a]stern water dragon, Physignathus lesueurii (Reptilia : Agamidae), along riverside habitat". Wildlife Research. 20 (5): 613–619. doi:10.1071/WR9930613. ^ de Velasco, Jesus Barraza; Glenn J. Tattersall (September 2008). "The influence of hypoxia on the thermal sensitivity of skin colouration in the bearded dragon, Pogona vitticeps". Journal of Comparative Physiology B. 178 (7): 867–875. doi:10.1007/s00360-008-0274-8. PMID 18491114. ^ Cuervo, J.J.; R. Shine (10 July 2007). "Hues of a dragon's belly: morphological correlates of ventral coloration in water dragons". Journal of Zoology. 273 (3): 298–304. doi:10.1111/j.1469-7998.2007.00328.x. Archived from the original on 5 January 2013. Retrieved 4 November 2009. ^ LeBas, Natasha R.; N. Justin Marshall (2000). "The role of colour in signaling and male choice in the agamid lizard Ctenophorus ornatus" (PDF). Proceedings of the Royal Society of London B. 267 (1442): 445–452. doi:10.1098/rspb.2000.1020. PMID 10737400. Archived from the original (PDF) on 25 July 2011. Retrieved 4 November 2009. ^ Cogger, H.G. (1994). Reptiles and Amphibians of Australia. New South Wales: Reed. ISBN 978-0-7301-0088-1. ^ Bauer, Aaron M. (1998). Cogger, H.G. ; Zweifel, R.G. (eds.). Encyclopedia of Reptiles and Amphibians. San Diego: Academic Press. pp. 134–136. ISBN 978-0-12-178560-4. ^ Moody, S. M. (1980). Phylogenetic relationships and historical biogeographical relationships of the genera in the family Agamidae (Reptilia: Lacertilia) (Ph.D. Dissertation). Ann Arbor: University of Michigan. ^ Frost, Darrel R.; Richard Etheridge (28 September 1989). "A phylogenetic analysis and taxonomy of iguanian lizards (Reptilia: Squamata)". University of Kansas Museum of Natural History Miscellaneous Publications. University of Kansas Museum of Natural History. 81: 1–65. Retrieved 5 January 2012. ^ Macey, J. Robert; James A. Schulte II; Allan Larson. (2000). "Evolution and phylogenetic information content of mitochondrial genomic structural features illustrated with acrodont lizards" (PDF). Systematic Biology. 49 (2): 257–277. doi:10.1093/sysbio/49.2.257. Archived from the original (PDF) on 13 September 2011. Retrieved 5 January 2012. .
^ Honda, Masanao; Hidetoshi Ota; Mari Kobayashi; Jarujin Nabhitabhata; Hoi-Sen Yong; Showichi Sengoku; Tsutomu Hikida (2000). "Phylogenetic Relationships of the Family Agamidae (Reptilia: Iguania) Inferred from Mitochondrial DNA Sequences". Copeia. 1991 (3): 616–622. doi:10.2108/0289-0003(2000)17[527:PROTFA]2.0.CO;2. ^ Joger, Ulrich (1 August 1991). "A Molecular Phylogeny of Agamid Lizards". University of Kansas Museum of Natural History Miscellaneous Publications. American Society of Ichthyologists and Herpetologists. 81 (3): 616–622. JSTOR 1446389. ^ Heads, Michael (2014). Biogeography of Australasia: A Molecular Analysis. Cambridge University Press. p. 119. ISBN 9781107041028. ^ B. Ananjeva, Natalia (October 2010). "Asian Agamid lizards (Agamidae, Acrodonta, Sauria, Reptilia): Phylogenetic and taxonomic diversity". Taprobanica: The Journal of Asian Biodiversity. 2 (2): 65. doi:10.4038/tapro.v2i2.3144. Wikimedia Commons has media related to Agamidae.